With its warm climate, safe environment and wide-ranging activities, the Costa Blanca is a great destination for children of all ages. There are a wide range of attractions and facilities within easy reach of each of the resorts, from wildlife parks to go karts, all ages are well catered for. In the evenings, under 18s are welcome in many of the family bars and restaurants and of course there are the beaches to keep them entertained. Terra Mitica The theme reflects the ancient Mediterranean civilisations such as Greece, Rome and Egypt where ancient civilisations, legends and heroes meet the very latest high tech rides and attractions - with speed, excitement and thrills thrown in. Well, you are on holiday so how's about a little adrenalin rush. 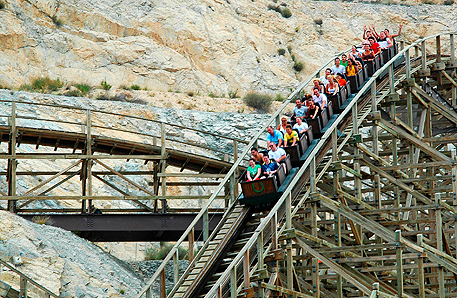 Just five minutes from the centre of Benidorm, Terra Mitica is a popular attraction for those of you who like a bit of adventure. Full timetables are also available online from the Terra Mitica Website. Mundomar You're going to be spoilt for choice at Mundomar in Benidorm and the kids will love it. A dolphinarium, parrot show, flamingos, turtles, sea lions, a bat cave (but no Robin), penguins, a children's park, and a galleon. The park is well equipped with a number of refreshment kiosks. If you're planning a party or a celebration with a difference, you might think about holding it at the restaurant or cafeteria. Aqualandia Within easy reach of all the resorts via the excellent road network, Aqualandia in Benidorm is FUN so the kids will love it, which means that parents will too! Assorted shutes / springboards / pools / rapids / waterfalls and black holes (that's right, black holes, but don't worry, 'cos you go in two at a time) will satisfy all members of the wet set. Themed areas planted with trees and shrubs house the Pistas Blandas, the Laguna, Niagara, Splash, the Big Bang... and the Kamikaze. But if they sound a bit too demanding, don't worry, there are gentle options for everyone. Bars, shops, restaurants, showers and lockers etc are all available. Karting Javea/Laguna Ribs Karting Javea/Laguna Ribs is fun for all the family, a karting track offering different power karts so everyone can race, a pool, a bouncy castle (weather permitting) and a bar/restaurant with occasional live music.